The Batman has faced many foes over his career as a caped crusader, but perhaps none have given him so much trouble as Hollywood, post-Christopher Nolan's Dark Knight trilogy. Though he's co-starred in blockbusters like Batman v Superman and Justice League, it's been a struggle to give Gotham's vigilant protector his own time in the DC Extended Universe spotlight. 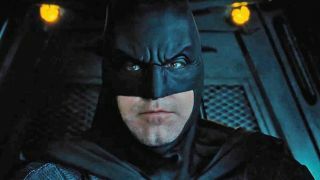 Thankfully, director Matt Reeves has finally offered some information on where the film is in the production pipeline. The first thing to keep in mind is that it's not even written yet. As reported by /Film, Reeves aims to have the first draft turned in by mid-August. "Right now, my head is totally into the script," he said. Should things go according to plan, the movie might even get fast-tracked, saving us from another 2-3 years of waiting and churning through more rumors. "What we’ve talked about is [starting production] hopefully in the spring or early summer, something like that." Speaking of rumors, one of the biggest surrounding the movie has been that Ben Affleck would not return as Batman. Reeves wouldn't outright confirm who will play the hero, instead stating, "There are ways in which all of this connects to DC, to the DC universe as well. We’re one piece of many pieces so I don’t want to comment on that except to say that I’m focused very specifically on this aspect of the DC world." Reeves did, however, say that he was still in conversations with Affleck. A more recent rumor has been that The Batman's plot would be based on the Year One story arc from the comics. If you're not familiar, Year One tells the story of Wayne's freshman year under the cowl - instead of focusing on big-name supervillains, it's mostly about his relationship with Jim Gordon and mob boss Carmine Falcone. Consider that rumor squashed. "We are definitely not doing Year One," Reeves said. "It’s just exciting to be focused very specifically on a tale that is defining for him and very personal to him. Obviously we’re not doing an origin tale or anything like that. We’re doing a story that is definitively Batman though and trying to tell a story that’s emotional and yet is really about him being the world’s greatest detective and all the things that for me, since I was a kid, made me love Batman." Reeves said he aims to be "noir-driven," and produce something that will take audiences "into the world of Gotham," but no specifics on villains, allies, or any of the little details that get conspiracy theorists' engines humming. Still, it sounds like things are back on track for this long-troubled movie, and Reeves has a vision and a plan. Lost track of all the hurdles The Batman has tripped over on its way to the box office? Don't worry, we've got you covered with a complete history of The Batman not going well.